Martha Shirley Epiphaneia Williams, a PhD student in the Department of Nutrition and Dietetics, Federal University of Abeokuta and a graduate research fellow at the Food and Nutrition Sciences Laboratory, IITA has been awarded a fellowship for the prestigious Norman E. Borlaug Leadership Enhancement in Agriculture Program (Borlaug LEAP). The Borlaug LEAP awards fellowships to outstanding graduate students who show great promise as leaders in the field of agriculture and related disciplines. As part of her fellowship, Martha will be working with her US mentor Ed Smith in his lab at Virginia Polytechnic Institute and State University while also continuing her work with Busie Maziya-Dixon, her CGIAR mentor and Head of the Food and Nutrition Sciences Laboratory. 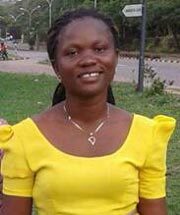 Martha’s work is geared towards Investigating the Retention and Bioavailability of Beta-carotene, Iron and Zinc in fufu produced from Biofortified Cassava Roots in Sierra Leone.